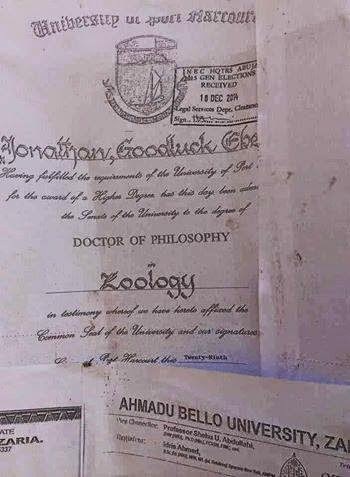 Did former President Goodluck Jonathan actually earn a Ph.D. in Zoology from the University of Port Harcourt? Or did he forge it? I know many people no longer care about this because the man is no longer of any consequence. But I care for at least three reasons. One, I have spent considerable energy in the past exposing or writing about fakery in high places, and I have had cause to call to question the authenticity of Jonathan’s Ph.D. Second, I have an enduring obsession with untangling truth from falsehood, an obsession that started from my formative years when my dad taught me that my name means one who distinguishes truth from falsehood. Third, I have uncovered authentic new evidence about Jonathan’s PhD that is not in the public domain. My interest in Jonathan’s PhD was rekindled when I recently got into heated exchanges with fellow academics on a Nigerian-themed scholarly listserv over Babatunde Fowler’s bogus honorary doctorate. In the course of my back-and-forth with my interlocutors, I said something to the effect that circumstantial evidence pointed to the fact that although Jonathan did actually enroll for a PhD program at the University of Port Harcourt, he probably didn’t complete it. Many factors informed my opinion. Well, that says nothing. Not even the copy of the PhD certificate Jonathan submitted to INEC is sufficient to establish the fact that he actually earned his degree. People in high and low places in Nigeria routinely produce counterfeit certificates. The evidence needed to establish the genuineness of his PhD is the title of his dissertation, the name of his supervisor, committee members, etc. 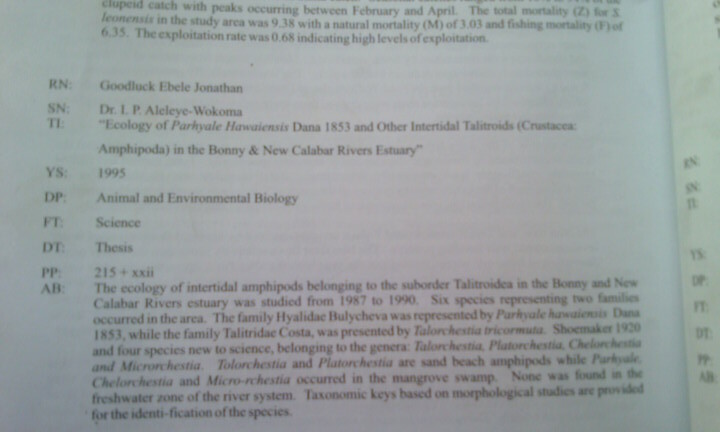 We know, for instance, that the title of Jonathan’s master's thesis is, "Stage l larvae of fresh and brackish water decapod crustaceans (excluding Natantial) Of the Niger Delta." We know this because Jonathan self-referenced his thesis in a 1985 conference paper he co-authored with a C.B. Powell, his supervisor who is late, and an I.A. Hart, perhaps a member of his master’s thesis committee. (However, although Jonathan's official CV says he earned his master's degree in 1985, the citation in the conference paper says the thesis was submitted and approved in 1984). Now, if we know the title of his master's thesis, why can't we know the title of his doctoral dissertation? An NGO made an FOI request to the University of Port Harcourt early this year for information about the title and committee members of Jonathan’s doctoral dissertation; the university said it would not release the information to the public. Why is basic information like the title, supervisor, and committee members of a doctoral dissertation such top secret that a university would refuse to share it with the public? Of course, this created room for doubts and for insinuations that Jonathan might not have earned his PhD. Protestations to the contrary from Jonathan’s supporters often base their defense on a shaky, slender thread of evidence. This led me to guess that Jonathan probably enrolled for the Ph.D., was assigned a supervisor, perhaps did some field work, but became too swamped by the demands of his work at OMPADEC (where he was assistant director) to write up his dissertation. Then the overly perverse differential Nigerian culture that conduces to the conferral of anticipated titles on people who haven’t earned them led people to start addressing him as "Dr. Jonathan." He probably got habituated to answering the anticipatory but unearned title and later embraced it, I thought. That has actually happened countless times in Nigeria. One of my professors at Bayero University Kano once told me how people kept calling him "Dr." when he returned to Kano after 7 years of an unsuccessful bid to get a PhD in English from a UK university. Each time people called him a “Dr.” he protested that he wasn't a PhD. But it didn’t stop people from calling him a Dr. He said the embarrassment of being called a “Dr." when he didn't actually earn a PhD became so intolerable that he was compelled to re-enroll for another PhD at Ahmadu Bello University, Zaria. He earned the Ph.D. three years later. A former governor of a state in the northwest also used to be called a "Dr.” because he once enrolled for a PhD, which he didn't complete. When the Salisu Buhari Toronto certificate scandal broke in 1999 and searchlight was being beamed on public officials with bogus certificates, the governor preemptively called a press conference and said he had never called himself a "Dr."; that it was other people who called him a Dr. because he was once enrolled in a doctoral program. 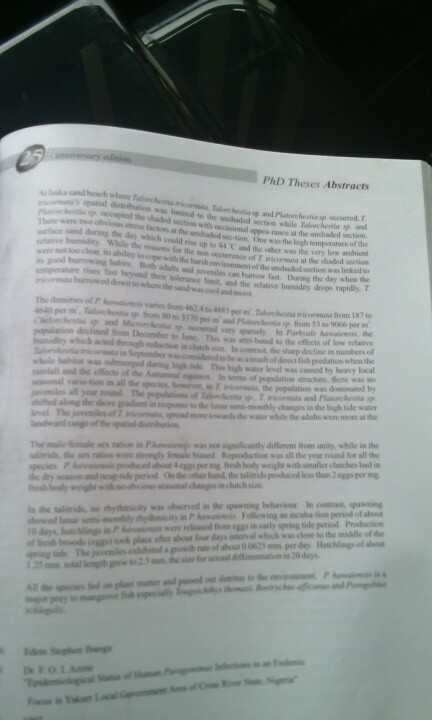 So what new evidence do I have about Goodluck Jonathan’s PhD? Well, since no journalist took the trouble to investigate this issue and rest it once and for all, I got in contact with someone who lives in Port Harcourt and who earned his PhD at the University of Port Harcourt in a field that is cognate with Jonathan’s. I asked if he could help me confirm the genuineness of Jonathan’s PhD. It turned out that Jonathan actually wrote a doctoral thesis. My contact, who by the way dislikes Jonathan, checked a publication of the University of Port Harcourt’s School of Postgraduate Studies titled “PhD Theses Abstracts 1983-2008.” It’s a record of Uniport’s PhD theses abstracts from 1983 to 2008, which was edited by B.W. Abbey, M. Horsfall, J.M. Ebong, and S.B. Arokoyu. 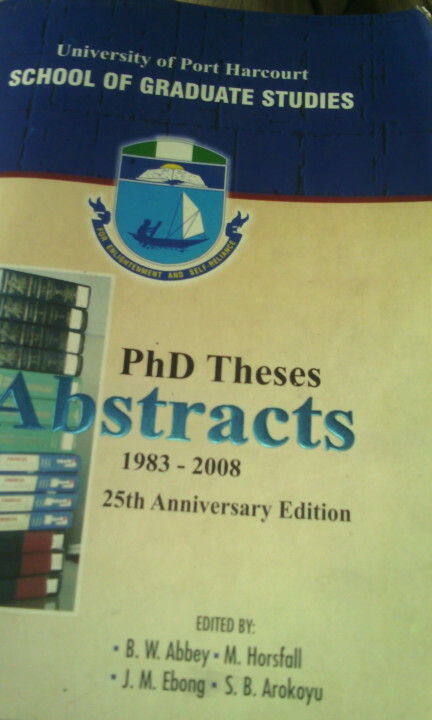 A record of Jonathan’s PhD thesis appears in this publication. Notice that this publication preceded Jonathan's ascension to the presidency. His thesis title is, “Ecology of Parhyale Hawaiensis Dana 1853 and Other Intertidal Talitroids (Crustacean Amphipoda) in the Bonny & New Calabar Rivers Estuary,” and it was supervised by a Dr. I.P. Aleleye-Wokoma. So contrary to what is available in the public domain, the late Prof. Charles Bruce Powell wasn’t Goodluck Jonathan’s doctoral thesis supervisor. Although the person who gave me this information said he hasn’t seen a copy of Jonathan’s dissertation, anyone who has earned a PhD knows that you don’t write an abstract until you’ve finished writing the entire doctoral dissertation. Plus, you can't have page numbers (Jonathan's dissertation was 215-pages long, according to the publication) if you have not written the whole dissertation. It is therefore reasonable to assume that Jonathan indeed earned his PhD. Now, I am sitting here wondering why in the world this information wasn’t made available to the public when it was asked for by an inquisitive public. 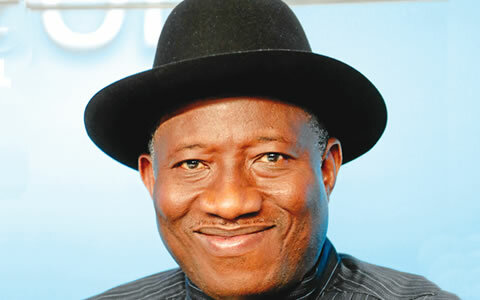 Why was everyone who should have answers to the questions about Jonathan’s PhD suspiciously secretive and guarded? I will never know why. But one thing I know is that, as I’ve stated here before, a PhD doesn’t make people smart; it’s just that many smart people tend to go for a PhD. But people with mediocre intellects can also get a PhD if they work hard, are persistent, and observe the rituals and protocols of doctoral education. Between Obama's "Birthers" and Buhari's "WASCers"